Bear, you can't crash into a wedding. They will be delighted if you approach them and kiss the bride a few times... I guess. But you already met your true love: mom ! Agreed - any bride would be thrilled to have you "crash" and be a part of her wedding! Oh Bear, if you got married where would you live? 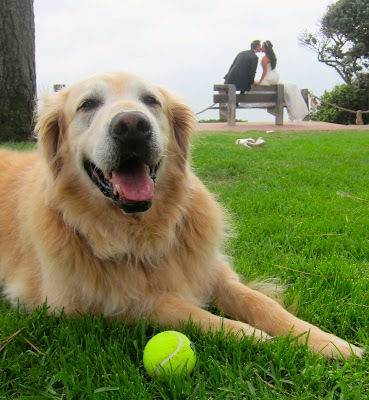 Bear, I think your true love might be taking your photograph! I just know that one day you'll have puppy love! OurGirl knew some people whose two dogs were the ring BEARers at their wedding. Maybe you could offer your services?! Love & loud purring from all of us! With that look on your face, I think you are looking right at her. We all know your true love is your Mom, Bear. :) I think the people having weddings would like to have you be a ring bearer! I know you must have the perfect outfit for it already!